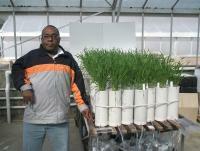 Thesis: The effect of biochar application on retention and availability of phosphorus on wheat. Low phosphorus (P) retention and availability is a problem in sandy soils. Leaching of P not only decreases its availability but can also cause algal bloom, thus polluting water bodies. Strategies are required for agricultural production systems to minimise P leaching while still enabling sufficient P availability to plants. Biochar is a by-product of thermal combustion of biomass and has cation and anion exchange sites that are likely to alter P retention in soil. This research mainly focuses on applying two types of biochar (poultry manure or wheat chaff) and increasing rates of phosphorus fertiliser in a sandy soil and subsequently measuring phosphorus retained. The findings of this study will improve our understanding of the role of biochar in P dynamics (leaching, retention and availability) and mycorrhizal symbiosis, especially in sandy soils of WA. The objective of this research is to quantify the capacity of biochar to retain P in soil and to measure its subsequent availability to plants. P availability to plants may be enhanced through mycorrhizal networks that are thought to be encouraged through biochar addition providing colonisation sites in the soil-matrix. Application of biochars increase the efficiency of fertilisers used. Higher yields can be expected for a unit of fertiliser applied along with biochar. Leaching losses can be prevented by applying biochars. Biochars adsorb P and supply it slowly to the plant for the rest of the growing season.